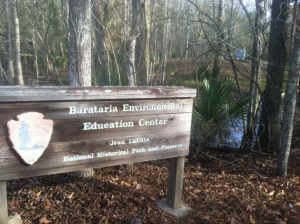 On January 29th-31th 2015, For The Bayou granted $10,000 to the Coalition To Restore Coastal Louisiana (CRCL) and assisted 90 volunteers in planting 750 bald cypress trees along the banks of Bayou Segnette in the Jean Lafitte National Historical Park and Barataria Preserve in Louisiana. 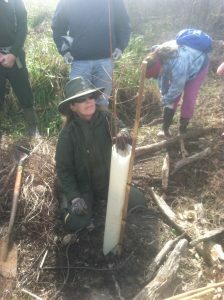 CRCL partnered with the National Park Service to plant these native Louisiana trees in an effort to restore the cypress forest that has been taken over by invasive Chinese Tallow trees, enhance wildlife habitat, and provide protection from storm surge. 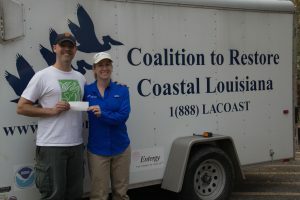 Jean Lafitte Restoration Project 29.787142, -90.151014 On January 29th-31th 2015, For The Bayou granted $10,000 to the Coalition To Restore Coastal Louisiana (CRCL) and assisted 90 volunteers in planting 750 bald cypress trees along the banks of Bayou Segnette in the Jean Lafitte National Historical Park and Barataria Preserve in Louisiana. CRCL partnered with the National Park Service to plant these native Louisiana trees in an effort to restore the cypress forest that has been taken over by invasive Chinese Tallow trees, enhance wildlife habitat, and provide protection from storm surge. Read the full report.